Alluring Lake Michigan sunsets, cities bursting with outdoor sculpture, intriguing architecture, countless design-centric industries, dozens of film schools, globally renowned art and design schools, award-winning symphony orchestras, live theater, ballet, entertainment districts teeming with nightlife and music, and ArtPrize, the world’s most lucrative art prize — West Michigan sustains a vibrant and avid following for the arts. Summer days come alive with festivals that celebrate dozens of ethnic cultures, music, dance, flowers and arts and crafts. Festivals draw people downtown or out to the parks for music, to try new foods, and meet their neighbors. These summer fests offer a chance to help local charities and Kalamazoo’s Boiling Pot Festival is even dedicated to ideas. 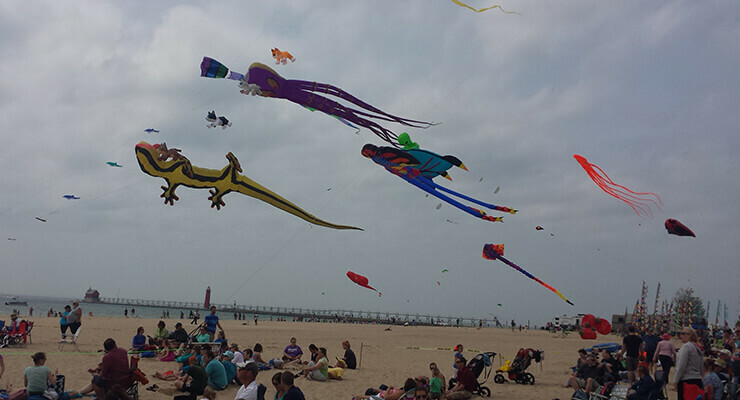 Many of these celebrations, such as Grand Haven’s Coast Guard Festival, Holland’s Tulip Festival and the Waterfront Film Festival have attracted crowds of enthusiastic supporters for decades. Art museums, artists’ studios and overflowing galleries offer works by world-famous artists such as Paul Collins and Mathias Alten to unknown budding artists who create for the sheer joy of it. We are home to one of the “Five Festivals You Don’t Want to Miss.” No, we’re not talking about summer festivals in Michigan. We’re talking about one of the top five worldwide. The Grand Haven area is filled with a vast selection of great food, fine dining and memorable restaurants from romantic hideaways, sidewalk cafes, and neighborhood favorites to those serving up elegance, spectacular harbor views and downtown charm. You will find an abundance of fun things to attend including theatre productions, museum exhibits and festivals throughout the year. Central Park Players is a community theatre organization dedicated to providing high quality theatre at affordable prices to Grand Haven and the Tri-Cities area since 1959. Coffee Gallery opened for business as an upscale art gallery with a creative and innovative coffee bar in 2001. The Grand Haven Arts Festival is set-up along Grand Haven’s beautiful downtown. The Grand Haven Coast Guard Festival has become a premier event with attendance of over 350,000 people including the nation’s highest ranking Coast Guard dignitaries from Washington, D.C. The Grand Haven Convention and Visitor’s Bureau offers a complete list of dining options. Grand Valley State University offers many performances, lectures, and concerts that are open to the public in Allendale and Grand Rapids. The Harbor Restaurant Guide lists the restaurants located on the water. Pigeon Creek Shakespeare Company seeks to offer performances of Shakespeare’s works to Michigan audiences in a variety of non-traditional theatre venues. The Salmon Festival is an outdoor, waterfront festival featuring live jazz music; gourmet salmon cook-off contest; fine art fair on the waterfront; Big King Salmon fishing contest; and more. The Depot Museum of Transportation situated on the banks of the Grand River in the former Grand Trunk Railroad depot, provides a glimpse at the past, a view of nautical heritage and a learning experience for all to enjoy. The Tri-Cities Historical Museum provides visitors an opportunity to look through the windows of time into the history of Northwest Ottawa County, including the communities of Grand Haven, Spring Lake and Ferrysburg. There is never a dull moment in Grand Rapids! A bustling downtown features a world-class opera, symphony, professional ballet, plus museums, sports and entertainment venues. Throughout the community you will find a unique array of restaurants, art galleries and shopping. DeVos Performance Hall is the 2,404-seat performing arts theater that is home to The Grand Rapids Symphony, The Grand Rapids Ballet Company, Broadway Grand Rapids and Opera Grand Rapids. Experience GR offers a comprehensive list of arts offerings by date, type, and more. Check out their complete listing of area eateries too. Always held the first full weekend in June in downtown Grand Rapids, Festival of the Arts is a community celebration featuring arts, entertainment, food and fun activities for the entire family. Frederik Meijer Gardens & Sculpture Park is a 132-acre botanical garden and outdoor sculpture park. Commonly referred to as Meijer Gardens, it has quickly become one of the most significant sculpture experiences in the midwest and is an emerging worldwide cultural destination. The permanent exhibits related to his presidency are the core of the Gerald R. Ford Presidential Museum’s program. In addition to the permanent exhibits, a succession of temporary exhibits draw upon the rich holdings of the entire Presidential Libraries System, the Smithsonian Institution, the National Archives, and others. The Grand Rapids Art Museum holds collections dating from 1400 to the present and are primarily European and American paintings and sculpture with 20th century works of international scope. ArtPrize is a radically open annual art competition, giving away the world’s largest art prize. Part arts festival, part social experiment – this international art contest is decided solely on a public vote. The Grand Rapids Ballet Company is Michigan’s only professional ballet company and has a rich history marked by steady growth, a commitment to excellence, and strong community support. The Grand Rapids Children’s Museum celebrates childhood and the joy of learning by providing an interactive, hands-on environment that inspires learning and encourages self-directed exploration. Grand Rapids Civic Theatre is one of the oldest community theatres in Michigan and in the United States. Also housed in the Civic Theatre complex is the School of Theatre Arts, which offers a full range of acting, dance and technical theatre classes for pre-school through senior adult students. The Grand Rapids Public Museum is among the oldest history museums in the United States. The museum includes a cafe, a gift shop, and a 1928 Spillman Carousel, which is situated in a pavilion over the Grand River. The Museum building also houses the Roger B. Chaffee Planetarium. The Grand Rapids Symphony is recognized as one of America’s leading regional orchestras. The Symphony presents more than 400 performances each year, touching the lives of some 170,000 people. Nearly half of those who benefit are students, senior citizens and people with disabilities reached through extensive education and community service programs. The John Ball Zoo has over 1,100 animals representing the wilds of Africa, Asia, South America, Australia, and the United States. Frank Lloyd Wright’s Meyer May House was built in 1908. Meyer May was a local clothing store owner; he built this house for his wife and two adopted children. In 1987 the house was completely restored by Steelcase — this included removing a later addition at the rear of the house. The house is open to the public for tours. Opera Grand Rapids produces three shows a year, and is one of two opera companies in Michigan. Founded in 1977, the Urban Institute for Contemporary Arts is Michigan’s largest contemporary arts center and a dynamic, multidisciplinary laboratory for the advancement of the art of our time. Home of the AHL’s Grand Rapids Griffins, Van Andel Arena offers the perfect combination of cosmopolitan flair and midwestern hospitality to make any event a success. Since marking its Grand Entrance on October 8, 1996, Van Andel Arena has attracted the biggest names in family shows, concerts and sporting events. Wealthy Theatre is one of the most technologically advanced historic theatres in North America. Highly skilled staff, industry-best equipment, vital neighborhood, free parking, and diverse programming attract faithful patrons throughout the year. The West Michigan Whitecaps is a professional minor league baseball team. A member of the 16-team Midwest League and Class A affiliate of the Detroit Tigers, the Whitecaps play 70 home and 70 road games each season. St. Cecilia Music Center, the oldest arts organization in West Michigan, is home to world-class concert series in the Royce Auditorium. A partnership with the Chamber Music Society of Lincoln Center brings chamber music concerts to Grand Rapids straight from the Lincoln Center stage. Music classes, camps and Junior Music Clubs take place throughout the year. The Avenue for the Arts is the neighborhood title for the South Division commercial corridor. Residential, commercial and nonprofit groups work together in a creative community to create a place for artists and several events throughout the year. The Kent District Library provides library resources and programs that enhance our residents’ quality of life. From early literacy programs for children to digital support for adults, they offer lifelong learning opportunities for all ages as well as the state’s best library digital collection available 24/7. The city’s newest museum is the Grand Rapids African American Museum & Archives. Located in the heart of downtown on Monroe Center, the museum has feature artifacts, recordings and oral histories. It also includes a gift shop with products from African American artists. The Jewish Theatre Grand Rapids provides theatrical productions with Jewish themes that are universal in appeal. The Holland Area Arts Council coordinates special community activities and collaborative events with other community organizations, serving more than 5,000 individuals annually through high quality art exhibitions, education, and advocacy. Zeeland has many different restaurants. There are many different events throughout the year like Zeeland’s Magical Christmas Parade and select retailer’s participant in Black Friday sales. Other fun events are also held at the museum. Don’t forget about the parks that are open throughout the whole year that can open to the public for different occasions! The Holland Historical Trust focuses on the power of the past to shape the future. Its educational facilities and collections are representative of a diverse heritage and are accessible to all through the Museum, Capon House, and Settler’s House. The Knickerbocker Theatre, built in 1911, is in Downtown Holland. This historic theatre is open to the public and presents a variety of films and hosts numerous cultural events throughout the year. Nelis’ Dutch Village is a step back into the Netherlands of over 100 years ago, complete with authentic Dutch architecture, flowering gardens, canals, and windmills. The history and culture of the Dutch come to life as associates, dressed in native costumes including wooden shoes, demonstrate the crafts and life in those olden days. Spend a day exploring downtown Holland while viewing more than 15 unique statues. 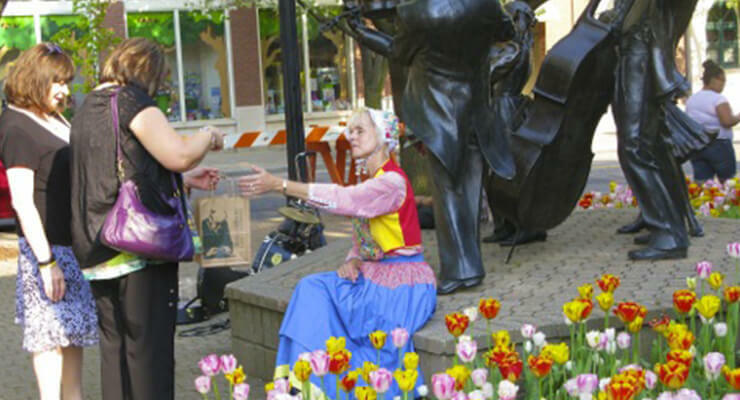 The Tulip Time Festival is a celebration of Dutch heritage and culture, a multi-generational event that has a little bit of something for everyone including; three amazing parades, multiple Dutch Dance performances, concerts, theatre, Dutch attractions, Dutch food, children’s events, trolley tours, and more. The Tulipanes Latino Art & Film Festival a non-profit organization that hosts a free, city-wide annual festival celebrating Latino culture through music, art, and film. Veldheer is Holland’s only tulip farm perennial garden. More than five million tulips are planted for guests to enjoy. A beautiful oasis within the city of Holland, Windmill Island features a 240 year old working Dutch windmill “De Zwaan” (meaning graceful bird). The windmill towers over 36 acres of manicured gardens, dikes, canals, and picnic areas. The iRock Jazz Festival is new in Holland for 2016. The 2 day event, happening on September 9 and 10, will feature several acts and is hosted by Live Music Matters. Muskegon’s coastal lifestyle offers an eclectic mix of restaurants and cultural venues in unique settings. 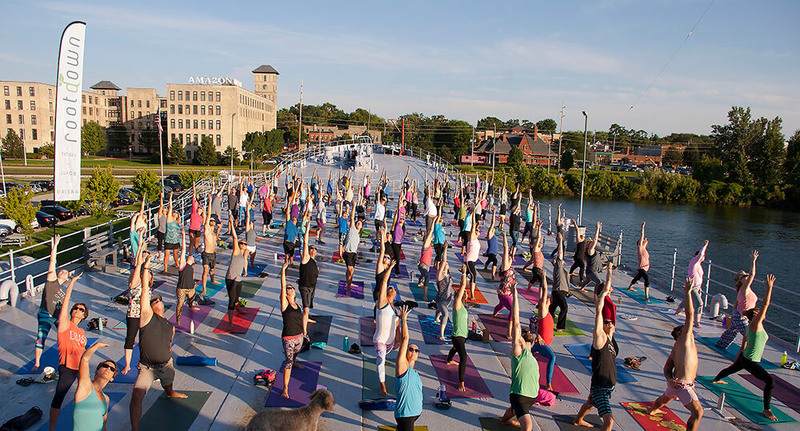 The community offers so much variety that Forbes magazine ranks Muskegon as number 10 nationwide for culture and leisure activities among cities its size. The beautiful Frauenthal Center, a versatile and artistic venue, offers performances and is rented for weddings and receptions, parties on the stage, business meetings, and speaking engagements. While you visit USS Silversides Submarine Museum, climb aboard and immerse yourself into the past aboard USS SILVERSIDES – a WWII submarine, and USCGC McLANE – a 1927 Coast Guard Cutter. Explore the decks and compartments and experience firsthand what it was like to serve on board these military vessels. West Michigan Symphony serves a regional audience with eight concerts annually at Muskegon’s Frauenthal Center for the Performing Arts, plus they provide dozens of educational and outreach activities for children and adults. With performances that range from jazz, to chamber, to cabaret-style vocals, The Block hosts over a dozen shows per season and is available as a rental hall for special events. The Holton Historical Society Museum allows space to display photos, oral histories, and documentation of families and farms, and maps of the Holton area collected by members and donated by citizens. Formerly the Muskegon County Museum, the Lakeshore Museum Center is made up of multiple sites and buildings. In addition to the natural and cultural history museum, it offers the Hackley and Hume Historic Site, the Fire Barn Museum, the Scolnik House of the Depression Era, the Archives and much more. Muskegon Civic Theatre is the only community theatre in Muskegon County, and utilizes volunteers in all aspects of the performing arts. The Muskegon County Museum of African American History provides local historical African American legacy information that will instill pride and motivation for young African Americans. The Muskegon Museum of Art, founded on a tradition of aesthetic excellence, is committed to fostering the life-long study and appreciation of the visual arts by strengthening, preserving, and exhibiting its collections; offering a wide range of traditional and contemporary exhibitions; stimulating learning and creativity through diverse public and educational programming; and enhancing community involvement and support in a safe, accessible, and welcoming environment. The Taste of Muskegon is a celebration of the area’s best restaurants, bakeries, and more serving up their specialties. For decades, art has been a driving force in downtown Muskegon. The Lakeshore Art Festival continues that tradition with a unique blend of arts, crafts, music, food, and fun along the scenic shoreline. The Festival features hundreds of artists and crafters, a Children’s Lane, street performers, and a food area including an Artisan Food Market and festival food favorites. Allegan Area Arts Council was started in 1998 exists to initiate and stimulate interest and participation in the arts for the Allegan area through programming, supporting local artists, promoting public art, and more. Arts and Eats Tour is a free self-driving tour of Allegan and Barry Counties. Participants get to chat with local artisans in their studios, see working farms, and sample local food from area eateries. Visitors will discover specialty food crops, fiber products, and heritage animals. The tour explores rural areas, forests, and towns via back roads, and out-of-the-way places. Allegan Annual Art Hop invites people to roam downtown Allegan to see art, hear music, and drink hot chocolate every December. Allegan County Fair is one of Michigan’s most popular county fairs with live performances, animals, a historic village, antiques, agricultural activities, and much more. The Allegan Antiques Market hosts over 400 exhibitors and offers a large variety of antiques and collectibles with many specializing in glass, pottery, china, primitives, advertising, vintage jewelry, sport and fishing, furniture, and more. Ox-Bow School of Art and Artists’ Residency is located in Saugatuck and offers a wide range of opportunities for artists at all stages in their career. The organization offers year-round programs that cater to degree-seeking students, professional artists, and those new to the field. Arts and Eats Tour is a free self-driving tour of Allegan and Barry Counties and the surrounding rural region. Participants get to chat with local artisans in their studios, see working farms featuring specialty food crops, fiber, and heritage animals and sample that local food from at area eateries. The tour explores rural areas, forests, and towns via back roads and out-of-the-way places. National Blueberry Festival is held in August and has drawn visitors for over 50 years with food, basketball, wine, yoga, live music, lots of blueberries, and more. Saugatuck Center for the Arts organizes exhibits, stage performances, workshops, a farmers market, and more. Hastings Summerfest is an annual summer festival held in downtown Hastings by the Barry County Chamber of Commerce Summerfest Committee. The event features arts and crafts vendors on the courthouse lawn, concessions, free trolley rides, children’s activities, a softball tournament, 3-on-3 basketball, 10K/5K run, roller hockey tournament, weight lifting contest, parade, car show, live entertainment, and a refreshment tent. Hastings Live! offers free concerts every Wednesday during June and July. The Thornapple Arts Council organizes the event. Middleville Heritage Days Festival centers on the early days of the village, founded in 1834, and features events for all ages. 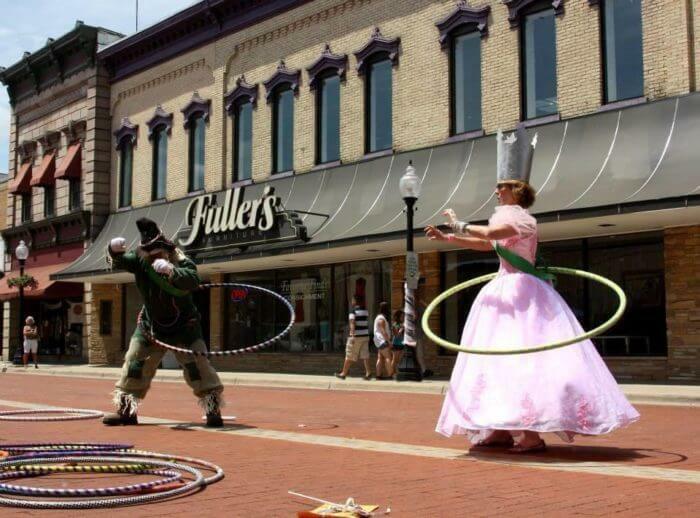 Delton Founders Festival is a annual, family-oriented festival in Delton during the second full weekend in August. Barry Rubaix Killer Gravel Road Race & Founders Fall Fondo Bike Race, like the classic it’s named after, Barry-Roubaix tests riders against (80%) rolling gravel roads, pavement, one mile of rough two track, rocks, sand, mud, and possibly snow and ice as riders traverse the scenic roads of Barry County. Roots Music Festival celebrates folk, blues, and bluegrass with performances and workshops every September. Thornapple Arts Council Jazz Festival was started in 2003 and has grown to be the largest jazz festival of its kind. Though its clinician program, it has matched more student groups and performers to professional jazz musicians than any other festival in the United States. This non-competitive festival puts education, jazz promotion, and appreciation at its core. Barry County Brewfest is the self-proclaimed ‘freshest’ beer fest in West Michigan and brings people together every August. Arts and Eats Tour is a free self-driving tour of Barry and Allegan Counties. Participants get to chat with local artisans in their studios, see working farms, and sample local food from at area eateries. Visitors will discover specialty food crops, fiber products, and heritage animals. The tour explores rural areas, forests, and towns via back roads, and out-of-the-way places. Gilmore Car Museum works to tell the history of America through the automobile. They foster experiences which connect people with the history, heritage, and social impact of the automobile through collecting, preserving, and interpreting its story. Expect to see over 50 vintage vendors at the Wizard of Oz Festival and watch the classic movie for 25 cents, the price of a ticket when the movie first debuted. John C Blanchard House, also fondly known as La Palistina, is an original 1880s home built from area pink sandstone and is available for historic tours. Come to the famous Ionia Free Fair and enjoy daily shows and entertainment including Rodeos, Monster Trucks, Motocross, Ionia Idol and more. Enjoy first run movies, free movies, and more at Ionia Theatre. You can easily spot their marquee from W Main Street. Support Big Brothers, Big Sisters at the annual Autumn Celebration – Chili Dawg Challenge. Join in eating contests or sample a variety of Chilli Dogs yourself. The Hometown Holiday celebration features an Electric Light Parade through downtown Ionia, a visit from Santa, a Christmas Bizarre, and a Jingle Bell Walk/Run to begin your holiday season. Munch on local food, register to win door prizes, and explore more than 100 area restaurants, non-profits, small businesses and Main Street companies at the Ionia Expo. Support the Ionia Public School District at their annual Community Dinner. Admire the couple hundred cars from generations past at the Classic Car/Truck Show. Attend the Farm Power Show for farm equipment demonstrations, live music, and tractor pulls. Watch Fourth of July fireworks from the Fair Grounds at the Ionia Independence Fireworks. Ludington Area Center for the Arts organizes events, exhibits, cultural collaboration opportunities and works to support local artists, and much more. Historic White Pine Village allows visitors to travel back in time to see small town Michigan life as it was the late 1800s and early 1900s. Set on 13 beautiful acres overlooking Lake Michigan, visitors can visit more than 30 museums inside original buildings that depict Mason County’s history. The Mitten Bar is a popular venue for live music and craft beer. Western Michigan Fair is held every year at the Mason County Fairgrounds. Freedom Festival Parade takes place around July 4th and features floats, bands, politicians, local residents, and the Scottville Clown Band. Thousands line Ludington Avenue to watch this hometown parade as it marches downtown from Madison Street to Lakeshore Drive. Aglow on the Avenue lights up the streets every year on the Saturday following Thanksgiving. The Fighting Falcon Military Museum is a local history museum showcasing Greenville efforts as well as a replica of the CG-4A Glider. Crossroads Theatre Guild has been the home of local, live theatre in the county since 1986. Dulcimer Funfest takes place each year during the third weekend in July and is the largest hammered dulcimer festival in the country. It invites musicians and music lovers from all over the country to gather at the Osceola County Fairgrounds in Evart. Some come for just a day, while others stay for the entire 3 day festival. Evart Summer Concert Series is presented by the Evart Downtown Development Authority (DDA) and offers a little of something for everyone. Great American Crossroads Celebration is Reed City’s annual family festival. LeRoy Area Historical Society maintains a museum that catalogs and preserves the history of the pioneers of the LeRoy area, their families, and the history of life in northern Michigan. Marion Area Historical Museum is dedicated to preserving the history and artifacts of Marion and the surrounding area. Marion Old Fashioned Days often features a parade, classic car show, softball games, music, tractor pull, and plenty of children’s activities. Music and Arts in the Park takes place each summer in Reed City. For more information contact the Reed City Recreation Commission at (231) 832-2245. Old Rugged Cross Historical Museum is located north of Reed City and celebrates the life of Reverend George Bennard, writer of the hymn “The Old Rugged Cross.” In addition to celebrating its namesake’s life, possessions, and music, the museum also depicts local life before 1900. It has displays of early farm equipment, shop tools, models of early logging operations, Native American artifacts, an antique fire hose cart, and a 1930’s era fire truck. Osceola County 4-H/FFA Fair and Fairgrounds continue traditions started in 1875 when the county started having county fairs. The fairgrounds are also open to camping, community room rental, and hosts several large events each year. Osceola League for Arts & Humanities (OLAH) is an art studio for teaching and promoting local artists. The Crossroads Theatre Guild and Osceola Quilt Trail are also part of OLAH. Osceola Quilt Trails are part of a volunteer public art movement which celebrate rural heritage, traditional arts, and involve area residents. The Osceola Quilt Trail is a self-guided driving tour featuring over 95 boldly painted 8’x8’ and 4’x4’ quilt blocks on barns, businesses, homes, and other buildings. The Osceola Quilt Trail is one of the largest quilt trails in the country.